Maybe I’m a bit out of control with the red right now. This was done on the small 5-inch Mirrix Lani loom. I learned some lessons here, but I’m don’t think I will ever apply them because I didn’t really enjoy weaving this very much. You can tell by the ribs of the warp the direction this was woven. Curves are a bit wonky, as is size. One of the most important lesson I learned from this is to not mark the warp with the design until the first element is finished. I ended up with so many marks I couldn’t tell what was what. When I decided on doing this little piece, I was thinking maybe a color word for each color, or the same word in different fonts. Now I know that the idea of weaving words is better than the actually weaving words is–for me. Do you ever feel like you’re not getting anything done until you look back at the week? That’s my place right now. I’m always trying to figure out where I put my reading glasses. They’re usually on my head or hanging from my shirt. I’m trying to get rid of the carpenter bees, but they keep multiplying. Whack-a-mole, anyone? 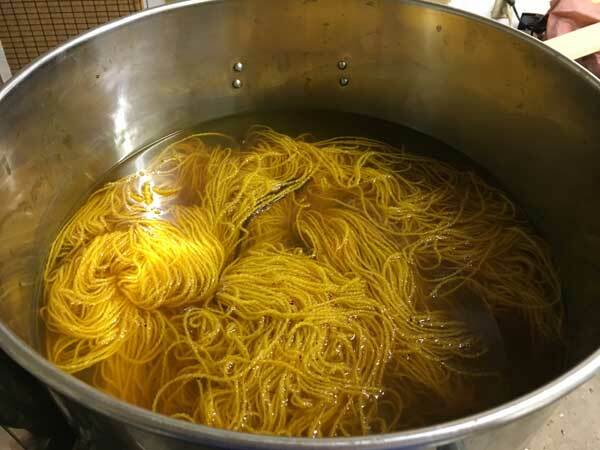 And here’s what I’m dyeing right now. 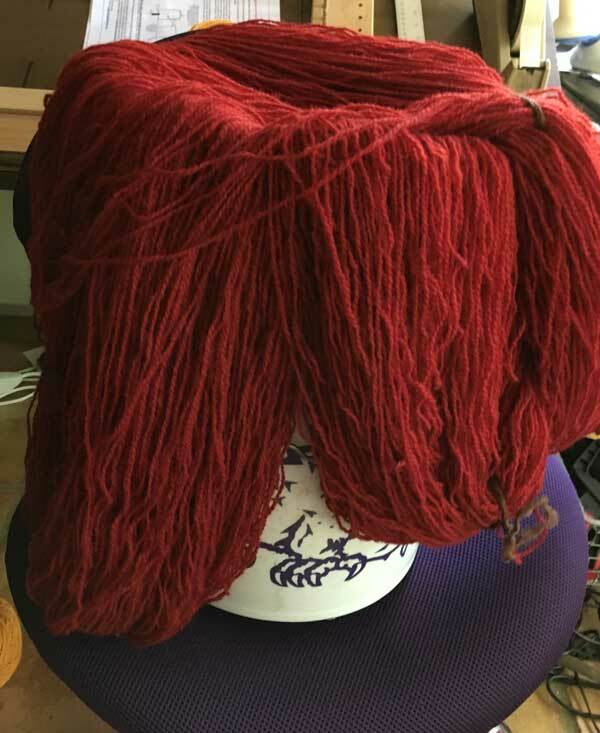 Both of these are two of my favorite colors to dye and use. The mustard, at 1.5% is at a slightly higher percentage than my usual 1%. 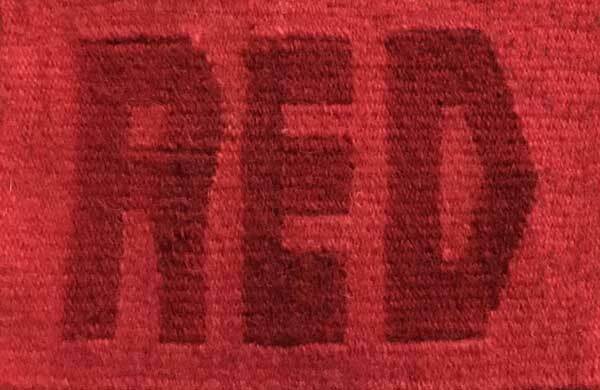 The red is 2%. I use Sabraset acid dyes from ProChemical. I think the next up will be a purple of some kind, and finally some black. I do still have that black and white piece to weave! 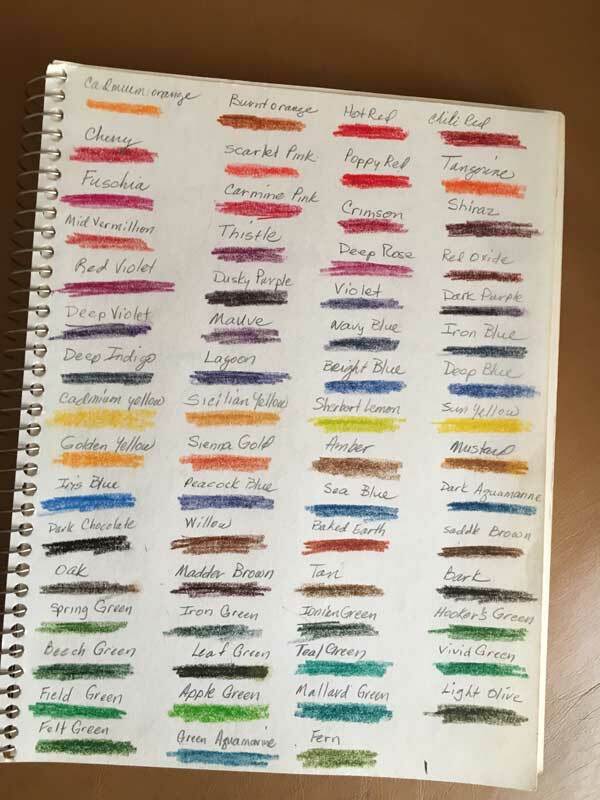 Because I was going to do some design work, I got out the Inktense pencils, but then when I looked at them all, I decided a color chart might be helpful. Here you see the fruits of my labor. They still need a wet brush going-over, but that’ll come later. Maybe something like paint chips would be better? At least they’re in color groups! This entry was posted in Art, Design, Dyeing, Tapestry, Weaving on May 10, 2017 by Sherri.